Mobile World Congress 2017 held in Barcelona proved very fruitful for the UC browser and QMobile. 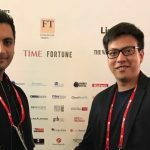 Zeeshan Yousuf, Director of QMobile and the GM Global Traffic and Promotion of Alibaba Mobile Business Group, Robert Bu, as a representative of UCWeb met at the event. The two envoys agreed upon on a mutual collaboration. UC Browser, a product of Alibaba Mobile Business Group, is the second most used mobile internet browser in Pakistan with over 25% market share. It is always looking for avenues to optimize user experience. For best user and Internet experience, UC browser has partnered with QMobile, the leading smartphone brand with over 50% market share. “We are glad for this collaboration. We keep trying to improve smartphone configuration, not only for the hardware, but also for user experience. And this partnership with UC Browser is a leap forward for enhancing user experience,” said Zeeshan Yousuf, Director of QMobile. Alibaba Mobile Business Group has initiated UC browser and in no time the browser has become the 2nd most used mobile browser in Pakistan. UC Browser last year joined hands with Twitter and Microsoft Bing. They also launched UC Cricket, a mobile gateway to all things cricket. UC browser is famous for its browsing and downloads speed and QMobile is famous for its elegant and reasonable smartphones. So, the partnership between two entities can prove very beneficial. In Pakistan, cyberspace connectivity is mostly done through smartphones. 70 percent of the web traffic is generated by mobile phones owners. Moreover, the number of 3G/4G users have reached 37.57 million. So, Pakistan is a goldmine in terms of investment in mobile browsing capabilities.